My excuse this week? Lack of respect of my break times by my boss and colleagues has meant that I was away from my computer during breaks, hiding in unoccupied rooms, in the dark, fuming. The only way I could get any peace! So. Today I am on a train travelling to London to deliver my work for the Society of Botanical Artists exhibition which starts June 5th. This means a relatively peaceful two hours on the train. Ideal time to write this post on my phone. I did buy extra data in advance as I predicted, accurately, that the wifi on the train would not be working. Has anyone ever successfully accessed the wifi on a Virgin train on the West Coast main line? Virgin wifi worked on Lancaster station but not on the train. From a mental health perspective this has been a hard week. Though the dizziness has gone I have had several episodes of low mood and one of these was quite severe. I think planning for this journey today, and my concerns about it, was not helping. I feel better now I am on the train and almost miraculously managed to get my reserved seat! Last time I promised pictures of the places in the garden where I grow the special plants I photograph. The garden as a whole is long and narrow and sloping down to the West. The bottom half of it is largely my territory, dominated by the greenhouse. This photo with my growlight on in the greenhouse illustrates the garden as it looks from the house. 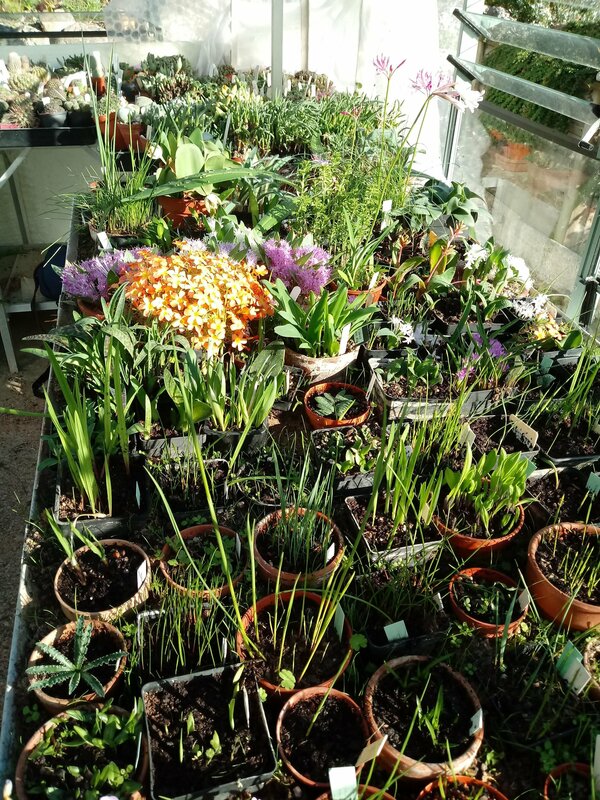 The plants in here are predominantly winter-growing bulbs, so look at their best from October to April and go dormant in summer. The frames are block built raised beds topped with commercially available ‘Access’ frames which are strong, tall and allow total control of ventilation by sliding or removing the glass panels. The shade frame houses the more precious woodland growing plants such as dwarf Trilliums etc. It only gets glass cover from November to February to keep off the worst of our winter rain. During the summer months it is given some simulated woodland shade by attaching shade cloth to the frame. The two bulb frames house bulbs from the Mediterranean, Asia or the US , which are totally cold hardy but benefit from a little protection from winter weather and also from too much rain in summer when dormant. The soil in here retains a little moisture which suits the deep roots of Cyclamen graecum especially. In winter the covers go on again. They are removed in February forvthe start of the spring flowering season. The raised alpine bed houses those things too tiny and vulnerable for life in the main rock garden. Some are planted in or between lumps of porous tufa which is a tried and tested way to grow tricky alpines. The lovely Devils Claw, Physoplexis comosa and the delicate Campanula choruhensis thrive in this environment. On the house side of the greenhouse is the main rock garden. I will feature this properly another time. It’s so nice to see the whole picture. Your set-up is very impressive and looks like a lovely place to spend time. I love the Devil’s Claw! Hope you enjoy your trip once the stress of train travel is over. Such a delightful insight into your garden. Looking forward to seeing more of your rock garden. Wow, what a collection. I bet that keeps you busy, Darren. Regards. Tracy. What a wonderful collection and while scrolling down pictures and reading about them I am amazed to hear your knowledge about each plant. You would be having a busy day looking after all of them. Such a wonderful post! Your gardens are absolutely lovely and such a wonderful place to escape to, its heavenly! The pictures really made me smile especially the mandrake. I hope you continue to feel better and I am so happy your trip to London was a successful one, how exciting. Big hugs and love to you my friend, you are incredible! Thank you Ali. I always wanted to grow the Devils Claw but never had much luck until I tried it on the raised bed between two lumps of tufa. Thank you my friend. It is bigger than most suburban gardens. Being on a steep slope that goes down to the West Coast main railway line (amongst those trees at the bottom) meant that it has only been useful for gardens. It has its problems. Low fences and noisy neighbours! It does Tracy. Especially repotting the bulbs every other year. I take a full week off work to do it. I. have speculated a lot recently about my heart no longer being in it. The future of the collection is in some doubt as a result. Thank you Lisa, lovely as always! I am in desperate need of some time away from things to be honest. I have some news soon on the Mandrake front…. It is obviously a labour of love Darren, must take a huge amount of time and effort! Darren, you’ve been through a long winter. It is hard to stay motivated and cheery in all that gloom. I wrote this poem last year. You might like it too. No pressure to look at it though. I’m still catching up on posts and I’m glad I caught this one. You amaze me. Totally. How do you keep all of those plants not only living but thriving! I tend to buy plants and watch them slowly give up the ghost. This was a terrific tour and I look forward to more. I live a gardener’s life vicariously through you!